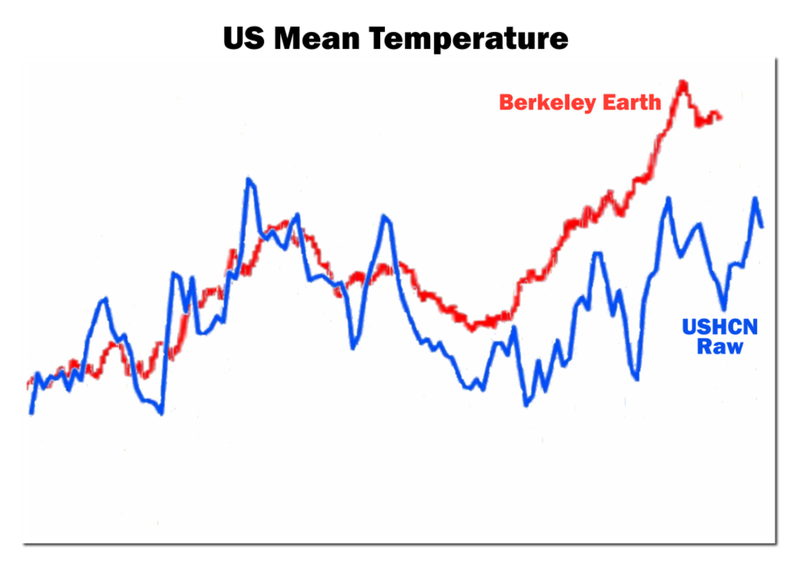 Berkeley Earth’s US temperature graph shows an impressive hockey stick. 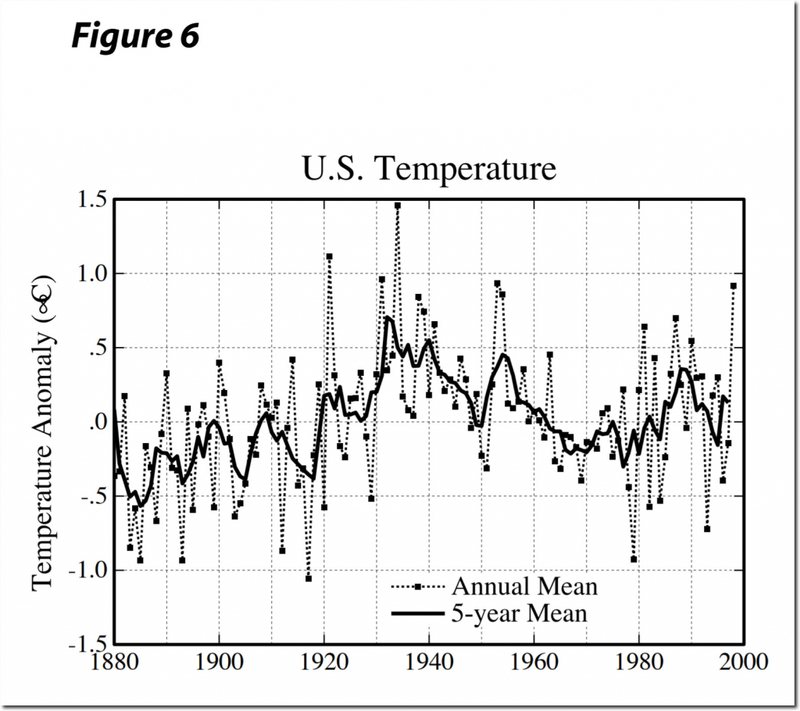 In 1989, NOAA said the US had not warmed over the past century. Berkeley Earth showed nearly 1C warming during that same period. In 1999, NASA showed the same thing – little or no net warming since 1895, with the 1930s as the hottest decade. The USHCN raw data shows a cyclical pattern with no net warming over the past 80 years. 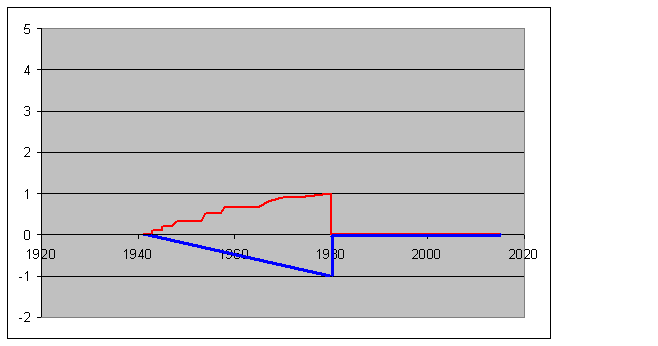 The graph below overlays The USHCN data and the Berkeley Earth data at the same X-Y scale. Their Y-axis temperatures are ridiculously low, so I normalized the Y-axis to the left side of the graph. The USHCN raw temperatures closely match the NASA 1999 US temperature graph. But that didn’t fit the global warming agenda, so NASA altered the data. There are serious investigations into engineering blunders. Forensic economics–to investigate the absurd theories and practices behind central banking. And “Forensic Climate”–to investigate the absurd theories and data treatment in climate promotion. And ever notice the investigations into medicine, accounting, and engineering are seriously compromised when government is involved? The FDA supports the favored medical corporations, government accounting would result in prison if done in the private sector, and engineering investigations into the WTC towers, select airliner crashes, and other politically sensitive events were done in such a way as to have a result that supported the official government narrative. YES! Government control of the people is what it’s all about! The sheeple will follow them anywhere. Richard S. Lindzen: Alfred P. Sloan Professor of Meteorology at the Massachusetts Institute of Technology and lead author of Chapter 7, “Physical Climate Processes and Feedbacks,” of the Intergovernmental Panel on Climate Change’s Third Assessment. an issue becomes a vital part of a political agenda, as is the case with climate, then the politically desired position becomes a goal rather than a consequence of scientific research. This paper will deal with the origin of the cultural changes and with specific examples of the operation and interaction of these factors. In particular, we will show how political bodies act to control scientific institutions, how scientists adjust both data and even theory to accommodate politically correct positions, and how opposition to these positions is disposed of. is designed to give ALL answers sovjet needs. Climate Science is the multitool army swiss knife to give them all results they want and need. With all the dataadjustments,rewritten history,cheap excuses,hockeysticks and moved goalposts climate science could be turned tomorrow into the coming ice age if they want to. climate scientists in the 70ies were praying for to save us from the ice age into something apocalyptic. but is great to create fear and guilt and a global tax. Good link. Little consideration is given to how people tend to believe what social pressure urges them to believe. Altruism is so entrenched as to almost never be questioned, and Soviet and National Socialism leverage this uncritical acceptance to reinforce the popularity of their derivative memes. Climate disaster goes back to 1960 Soviet conditioning. Millerites went through two Disappointments and changed their name rather than their beliefs in failed prophesies. Is some eminence grise bankrolling them? People are eager to believe nonsense, and that demand gives rise to a supply which can amplify into a vote or revenue stream of bought or conditioned minds. So how do we recognize the language of “ideology” and distinguish it from a “principled position”? One common clue is that those who hold a principled position welcome arguments; they welcome having their position tested and possibly corrected. A principled position always has room for increased subtlety and greater complexity. Holders of an “ideology,” on the other hand, will tend to eschew argument or any examination of the ideology’s underlying presuppositions or premises, often refusing to concede that greater subtlety may be required to apply the principles to real-life situations. Ideology disdains argument; people with principled positions embrace it warmly and engage in it gladly. If, rather than trying to glean evidence from observable reality, a person seems more intent on forcing reality into the categories of his or her system, then you’re dealing with an ideologue. If evidence supporting a theory is trumpeted loudly and repeatedly, and evidence that may refute it is ignored repeatedly, then it’s an ideology, not a principled position. If every bit of data, no matter how contrary, is taken as evidence of the truth of the theory, then it’s ideology, not science. i) Can you explain why you think that what you said is true? ii) Can you define that term you just used in your own words? Over 92% of BEST stations have a 1-5C warm bias. The BEST science money can buy. My pleasure! I love to tell the story, ’twill be my theme in glory. Lord, I have sinned and drank more than my measure of Scotch but I spake righteously about the century trend of diurnal temperature range in the Lower 48! It’s funny how the leftoid robots are screaming about fictional warming. I’m sitting here this morning looking at mpegs and photos of our sun over the last few weeks, and it’s completely devoid of sunspots. I’m a bit concerned. I think the world is about to become very chilly. The sun’s output has apparently dropped by 0.1% lately, which is bad. I think I remember learning that the sun’s output dropped by just about 0.5% during the last ice age. Fear not. when the sun cools, the warm oceans will mitigate temperature. And when the sun heats up, the cool oceans will mitigate temperature. I live next to the ocean and your comment, reflecting my experience, points out a plus for my location. At first, I couldn’t understand how the lack of sunspots could affect the sun’s output. Then I realised that the sunspots are created by turbulence inside the sun. Turbulence is what increases heat transfer from the core of the sun, where the nuclear reactions happen, to the surface, where radiation of heat happens. So without turbulence, the heat transfer is reduced & the suns output diminishes. It isn’t because the sun is burning less fuel, but because the heat transfer isn’t happening. It’s a little bit like a bathtub with hot water on the bottom and cold water on top. It isn’t stable long term, but it needs an initial disturbance to create a path by which the hot water can move above the cold. There are no nuclear reactions in the core of the sun. All action is on the outside. The sun is in an electrically driven glow mode. Remember our iron sun guy that used to post every day? I think his name was Oliver. I wonder what happened to him? He has correlations with all the minima (Sporer, Dalton, Maunder) and his theory is falsifiable as there is another shift coming up in the next few decades. This is all so confusing, I just don’t know who to believe, with the Internet we have so much information it’s just so confusing, and our Great and Glorious Leaders have told us we’re warming, and I’ll trust NASA any day over Tony, and isn’t he a Denier and Birther and Occupier and an oil company stooge, and can’t we just have one really truthful news source that tells us everything so everyone isn’t so confuuuused? How can you trust NASA when NASA from before does not agree with NASA now? To me this means some combination of lying and/or incompetence. The common history from older NASA charts should match that same history from more recent ones. The fact that they don’t is proof of lying and/or incompetence from NASA. Tony has made his code available for all to use. Just try it for yourself. 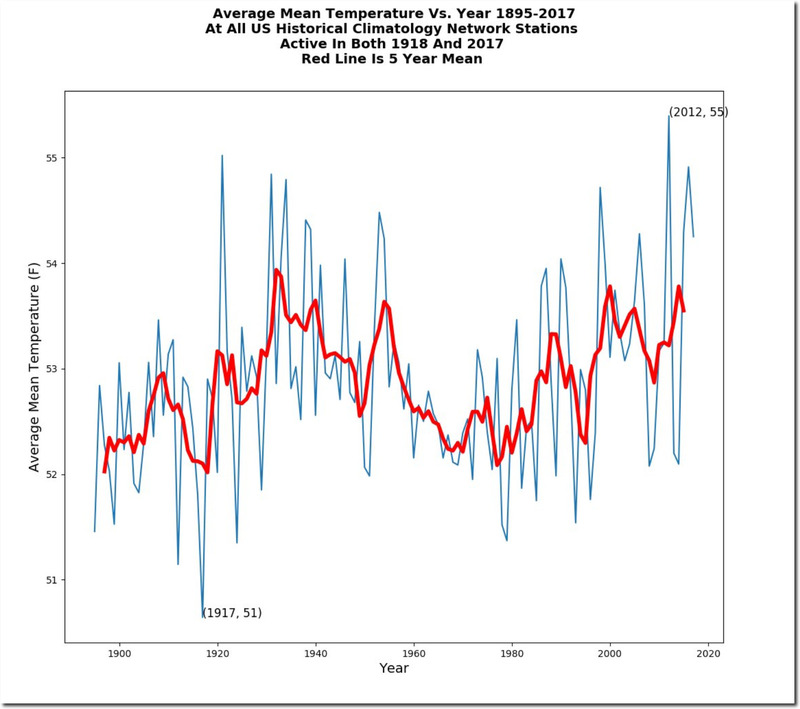 I remember back in the mid 1990s when the warmists argued the temperature data was entirely accurate and required no adjustments, error corrections, etc. Today they argue that it needs adjustments and error corrections. Then they redo those over and over again no less than annually. So let us assume these people aren’t simply lying to fit data to their theory, their actions indicate a data set that is simply absolute garbage. So either the raw measurements are fine and errors follow the rules for large data sets and drop out as Tony has shown or it is complete garbage or “climate change” is a fraud. There’s no option for “climate change” is real. Simply there isn’t any, we don’t know, and fraud. I sincerely hope that those that are busy doing those adjustments are sitting at home right now not getting paid. They probably are. It took this truck driver an hour to pass through customs this morning at the Ambassador bridge between Detroit and Windsor. Usually it takes 15 minutes or less at 02:00. When I pulled up to the booth I noticed the officer was an older black guy. He looked a bit frazzled. Once he had asked his questions and handed back my pass port card I told him. “Thanks man for hanging in there”. He looked at me and with a little smile said “Thanks”. He’s there doing an important job and not getting paid and to my way of thinking every American should be recognizing and thanking all of those customs and border patrol or any other “nonessential” government types that are sticking to their guns and doing their jobs. 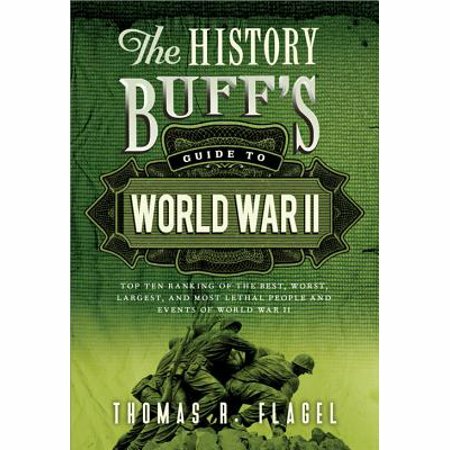 Hey Rah, thanks for recommending this book… just came in the mail and it’s impossible to put down! It’s good that there are dedicated government workers, but rest assured, they will be paid, even the ones who are home doing nothing will be paid when this “shutdown” is over. Welcome Johansen. Lots of interesting tidbits eh? Like I said. I accept the authors facts but not all of his conclusions or rankings in the lists. R. Shearer. According to what I’ve been hearing the administration could permanently furlough a good number of them if the POTUS so desires. Just think of that. Most of he EPA is off. The temperature adjusters? Most of the department of Education etc. Who else out of that nearly 900,000 would you like to see go. I am not saying it’s going to happen, but one can dream. 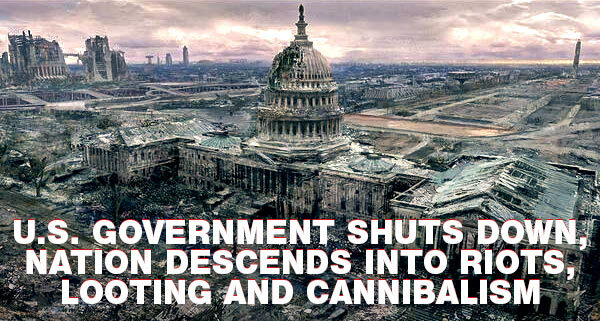 The Government is shut down?? “This negative feedback mechanism increasing ice growth is unlikely to be sufficient in preventing an ice-free Arctic this century,” Petty and his colleagues concluded. That is quite a walk back from Mann’s 2008 and Gore’s 2014 ice-free Arctic forecasts. So you can tell your panicked “warmist” friends, NASA says an ice-free Arctic is decades if not a century away (assuming you buy this latest explanation as being written in stone). As NASA can’t adjust the actual ice, their only option was to adjust the theory. and don’t trust people who are constantly right?! For guys like you they invented terms like denier,birther etc so that you can feel superior and smart when using them. tax payers money are not interessted in ‘solving’ these problems as they are no longer needed when the problems are solved. As they want to keep their jobs. That’s why drug problems are getting bigger and bigger the bigger the war on drugs is. Thank you, Tony (and many of the commenters on this site, t00) for being among the people that cannot be fooled all of the time. On a related topic, I discovered today that my favorite weather information site, Intellicast.com, was taken over by the Weather Underground and has now switched over to the crappy WU website. Of course, they have their “Top News” splash about Antarctica having “record low” extent and I’m sure going forward it will be full of global warming BS. Interestingly, I also noted that IBM, the Weather Channel, and Weather Underground appear to be one big happy family now. Hmmm. So, I’ve switched over to Darksky.net. So far, so good – no ads or climate blather there, just weather. Frank, you are right. Just saw that and I have already deleted my bookmark for Intellicast. The former site was perfect. The new one is garbage and now gone from my life. I already sent them a nastygram. If you’re just looking for radar. “Today, the solitary inventor, tinkering in his shop, has been overshadowed by task forces of scientists in laboratories and testing fields. In the same fashion, the free university, historically the fountainhead of free ideas and scientific discovery, has experienced a revolution in the conduct of research. Partly because of the huge costs involved, a government contract becomes virtually a substitute for intellectual curiosity. For every old blackboard there are now hundreds of new electronic computers. This video is showing it’s age, but if NASA wasn’t the patriotic servant of the people in the past as any tax payer would expect, what would impel anyone to think anything’s changed. NASA serves the will of the shareholders of the Military Industrial Complex and manufactured climate science is just another means to their end. When one considers that the 8 richest men have more wealth than 3.5 billion other people on earth, the possibility of a few men totally controlling the deep state along with its MIC is completely plausible. windy.com also produces some nice maps of various meteorological parameters. I found this gem in a search for Berkeley’s temperature analysis. Not very flattering. Berkeley Earth got some of its funding from a “non profit” group called Sea Change who in turn got its funding from a Bermuda based group called the Klein group that is believe to be funded by owners of the Russian petroleum industry, the Klein group also gave money to various other anti fracking groups. This was also mentioned in the Intelligence report on Russian interference in the US elections by was widely over looked, this can be found in annex “a” page 8. Interesting… Berkeley Earth is funded by Russian Oil. Surprise, surprise even the Koch brothers foundation and Getty foundation (Getty oil) gave Berkeley Earth lots of money. 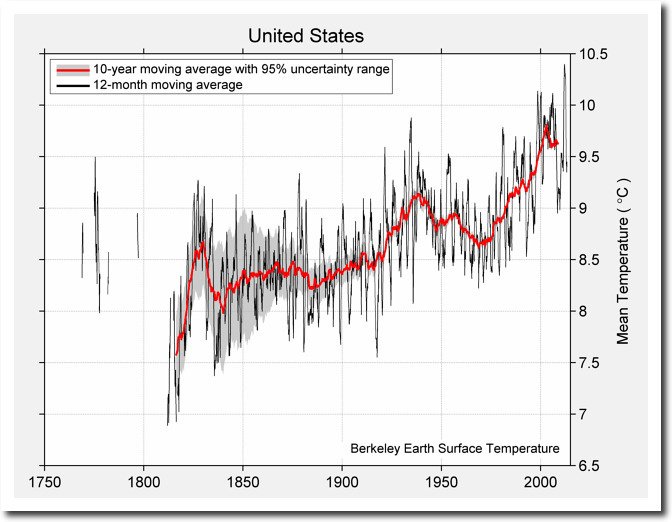 Why does the Berkeley Earth’s US temperature graph scale go from 6.5 to 10.5 degrees doesn’t anyone question that ? What are those temperatures between 1750 and 1800. Shouldn’t there be a Little Ice Age with lower temperatures? Global Warming is striking again here in Hoosierland. Freezing rain right now which is supposed to be turning to snow. Nasty stuff followed by the big dip in temps. Forecast low for Monday is -7 F.
Remember that alarmists want more of that nasty stuff. They must hate people in the North like Canada. Good morning from western Manitoba. Current temperature is -34C, and the wind chill is -46C. Frostbite warnings are out and my resident Toto doesn’t even want to go out to do her business. This is a forehead “burner” folks. Probably the coldest day of the winter. Buckle up and button down across the USA. That cold is going to reach some of us in Hoosier land. Temperatures up to -30 C below normal for us coming down from up your way. Big limb off that same western pine that was hit by lightning two years ago has come down due to the icing and wind. Thankfully the freezing rain has stopped and it’s turned to snow but I would not be surprised of some more limbs come down due to the weight of the snow added to that of the ice. He also said he predicts that the alarmists will be saying the cold and snow is due to global warming and some on “his side” of the argument will be saying it’s the beginning of a new LIA. LOL! Don’t expect to hear much from Griff because in a week or two all of the British Isles will have snow cover, including London. Rah … hopefully Griff is freezing in the dark. – 30C to -45 C all across northern Ontario and the prairies and the alarmists want it to be colder!! I think folks like Griff don’t realize how extremely cold temps get in some parts of the world and how deadly the cold is. Where are all the CAGW defenders? The USHCN of continuesely active for 100 year stations, the best placed stations, and NOAA own published record for decades, all agree with each other, and contradict BESERKLY and the alarmists cabal!! Come on defenders of the CAGW faith, at least appear on the field of battle. Where are all the CAGW defenders? looking at Australia? As the Earth cools the frequency of monsoons and cyclones hitting Australia will decrease. We are already seeing this decline over the last 50 years. Without the cooling drenching of rainfall from these events, the temperature of the interior of the continent will soar driving high pressure systems that push this super heated desert air towards the various coast lines where most of the people live and a brain dead media eagerly awaits to report record breaking high temperatures. Australia is likely to be hit hard by dryer hotter summer conditions as the next ice age approaches. This is a conundrum poorly reported and understood. Yeah, been busy and poked back onto this thread after being away… saw there were quite a few hits and checked in. Not a warmunist in sight. The scammers, charlatans and frauds have given up without a fight. Overlay on this plot the daily temperature range of an ‘average’ location and Best’s guesd will be lost in the noise. Potholer: Gives sources. References specific parts of those sources, including graphs, statistics, and the analysis of those things. Corrects any mistakes he makes in the description. Tony: Links no sources. Doesn’t reference anything besides graphs, which he attempts to interpret himself without even mentioning the analysis by the experts. Doesn’t make any corrections and accuses anyone debating of being part of the “deep state”. Dude, you couldn’t even get Scott Adams on your side. Potholer is as toxically effective. In his book “Propaganda”, public relations guru (and Freud’s nephew) Edward Bernays describes how, in the 1920’s, he seduced American women to start smoking cigarettes, largely by making the advertising suggestion that cigarettes represented “freedom”. His campaign took no more than 20 couples in New York to ignite the flame, so to speak. We’re all inclined to listen to Potholer’s nice, trustworthy British accent, and we might even feel like we’ve learned something profound after watching his “tipping point” see-saw animation. It’s amazing how good propaganda can get people to think they’re asserting their ill-defined “freedom”, or preventing some imaginary “tipping point”, by accepting totally irrelevant beliefs inculcated by competent manipulators. All without realizing precisely why. We’re all delicately vulnerable that way. Like a good trick, even after we’ve seen how it was done, we can still remain fooled. Freedom,Revolution,Fear and Good Intentions are the four methods they use to indoctrinate people. (and of course that they have the solutions and you must follow). Indoctrinate,Subvert,Pervert is their modus operandi in terms of institutions. and without the few useful idealistic idiots( the rest is hiding behind them and those idiots make it look authentic) would not be successful in selling their crap. LOL, sic assertions and you are 1 for six, well below the Mendoza line. There was six or seven links in this post alone. Sheesh!!! Tony regularly links to more then graphics. He does not attempt to interpret them, he does interpret them, and does compare them to disparate sources at different times. Did you even read or comprehend the heading above the USHCN graphic. You on the other hand poorly interpret what you clearly have not read. meteorologist on location? Why do NOAA adjustments invariably result in a greater warming trend? Especially inane when the majority of errors result in artificially induced UHI, and should be adjusted down. There are dozens of trolls Tony has not labeled ” Deep state”. Mr Sir, Dude, how many fallacies can you identify in that one sentence and the rest of your contribution? Little Man needs someone to interpret graphs for him. That pretty much says all one needs to know about Mr Wannabe. That’s not a problem. On his Twitter, he said he doesn’t like to do research. So if he wants to believe the Borg that CO2 is magic, that’s fine with me. Like you, he seems to want it simple; to believe one side or another. For some of us, it’s not about belief. It’s about following uncorrupted scientific data and seeing where it leads. Scott Adams is giving me lots of exposure. Obviously he wants people to see my work. Engineers and technical people use graphs for that very reason, they don’t require any interpretation other than scale and axis labelling. Dynamic parameters of nearly all electronic devices are depicted in graphs which require no interpretation other than the observer having an understanding of the parameter they represent. When you graduate from high school you may understand, if you pay attention. Your 41 min lecture video, where you explained the adjustment process, and showed how temperatures correlated with CO2 (and of course, time), clarified the discrepancies. It became obvious that warming was a fabrication, and that Climategate wasn’t an anomaly, but the tip of a larger iceberg of deeper corruption. Friday afternoon I spent an hour watching the video of the quarterly safety meeting the company I work for has. It’s required. A driver that doesn’t attend or watch the video of the meeting will not receive safety and performance bonuses. Of course this time of year the meeting topics center around winter driving and truck maintenance. They also reported on the new camera systems they’re testing. Both have dash cam and driver cam. I feel better about the one facing the driver after seeing how it works. Both cameras record on a loop and only transmit if the driver initiates them or if the truck sensors indicate hard braking, turning, etc. The industry has done several studies and estimates that about 80% of claims against truckers are fraudulent or end up with the trucking company being found liable when they should not have been. They should be mandatory for politicians. Oh, one other thing. They said two drivers from the Laredo TX terminal quit to go get the higher pay driving tankers for the oil fields. Both drivers came back. Both had been stopped by road blocks by armed Mexican Cartel members in Texas and told they were on a road that they controlled and if they were caught using that road again they and their families would be killed. Mexicans that escaped the horrors of Mexico to change the place they went into Mexico. In Europe we use Africans and muslims for that. The BEST algorithm seems to be very skilful at detecting step-change errors in the surface temperature record – especially *downward* steps (and we don’t like those do we?). And it is quite incapable of detecting gradual errors – especially gradually *increasing* errors like UHI. Now I’m pretty sure that all these step changes must be preceded by a long-drawn-out gradually built-up error. Typically, a weather station is established in a small rural hamlet which grows over several decades into a substantial town with lots of paved roads and car-parks. Then the weather station is then moved out of town to a more rural location (usually the local airfield). This causes a saw-tooth-shaped error pattern – a gradual build-up over several decades followed by a sudden cut-off. BEST (and all the others) don’t do this. By selectively adjusting for the sudden obvious down-step but not for the preceding gradual UHI rise, they are very effectively cooling the past (a.k.a pollution of history). Very effective visual aid, JCalvertN — thanks! 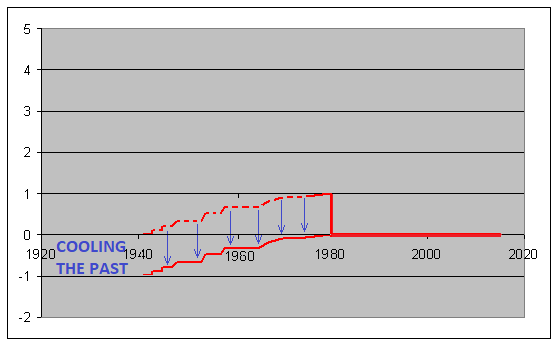 Older surface temperature measurements in the United States do require ONE correction—for the time of day of the measurement. There is an algorithm for that, and one can criticize that algorithm. Yet the need for a correction seems clear. My question is: Reviewing the underlying data, I believe Berkeley is doing more than that, but I’m not sure sure NASA is. Can anyone tell me whether this is true? Actual scientists put error bars on the data to accommodate their theories – they don’t alter the numbers and pass it off as real data.